Limited Edition Umbrellas for the 15th! 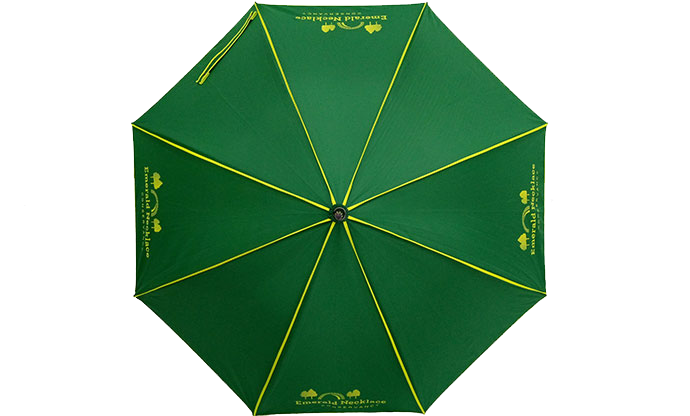 In celebration of Party in the Park’s 15th Anniversary, we are thrilled to bring back a limited quantity of a Party in the Park favorite — Emerald Necklace Conservancy custom umbrellas! In two stunning shades of green, this year’s double-layer canopy umbrella is elegant, sophisticated and sturdy in the wind. The Emerald Necklace Conservancy logo and piping is in a bright, spring green on a darker green shell. The 15th Anniversary Party in the Park logo is engraved on the handle. The PIP flower is on the inner light green canopy. Umbrellas are available for pick up at the Shattuck Visitor Center in the Back Bay Fens. Supply is limited. Get your limited edition umbrellas before they’re gone! Questions may be directed to Jamie Santucccio or 617-522-2700. Payable to: Justine Mee Liff Fund for the Emerald Necklace. Mail to: Emerald Necklace Conservancy, 125 The Fenway, Boston, MA 02115. Or stop by the Visitor Center with your payment. Proceeds benefit the Justine Mee Liff Fund for the Emerald Necklace.